Happy 4th of July one day late! If you celebrated yesterday, I hope you had a great, relaxing holiday. I only have three lunches to show this week because we were gallivanting all about so this post is going to be short and sweet. On Monday, I had a few spare minutes so I made Augie a checkered apple. With practice, I’ve gotten pretty good at making these and though I admit they’re still a bit too fussy for every day, I find I can whip them out pretty quickly now! 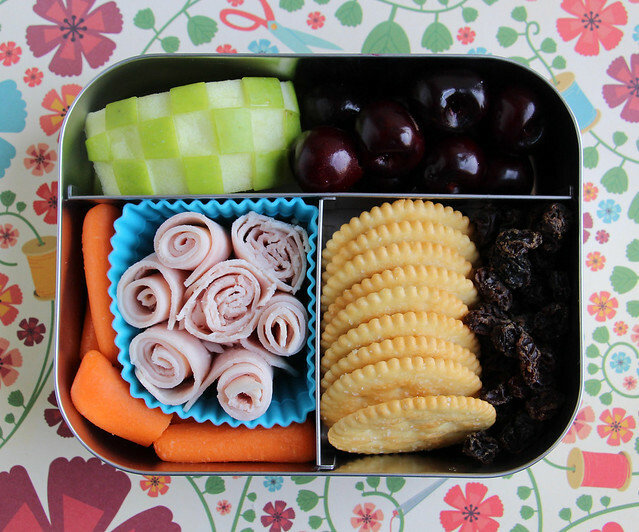 The apple and the rest of this lunch were all packed in our Lunchbots Trio. He also had bing cherries, carrot sticks, deli turkey roll-ups, fake Ritz crackers and some raisins I found in the pantry. The raisins were kind of dried up and admittedly not that appetizing, but I needed something to fill the last bit of space in the lunch box. Augie didn’t care though and he ate all of them. On Tuesday we went to the local science museum with some friends so Augie didn’t go to school. No packed lunches this time — we ate lunch in the cafeteria. 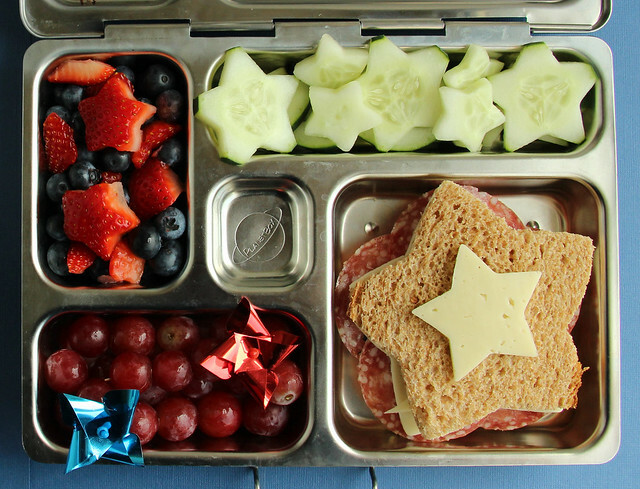 On Wednesday, I made this festive 4th of July lunch in the PlanetBox . It held blueberries, strawberries (a few were cut into stars ), star-shaped cucumbers, grapes on pinwheel picks, and a salami and cheese star sandwich. I made a video showing how to make this lunch step-by-step and though I wrote about it Wednesday, I’m reposting today because I think a lot of people may have missed it in the holiday hubbub. Though I’m specifically making a red, white and blue lunch the techniques I’m demonstrating are extremely versatile and can be used to make a bento of any theme (or no theme at all). Yesterday was the 4th of July, so no school! Today, Augie wanted a kitty lunch in the Lego bento box so I made him this little cutie! 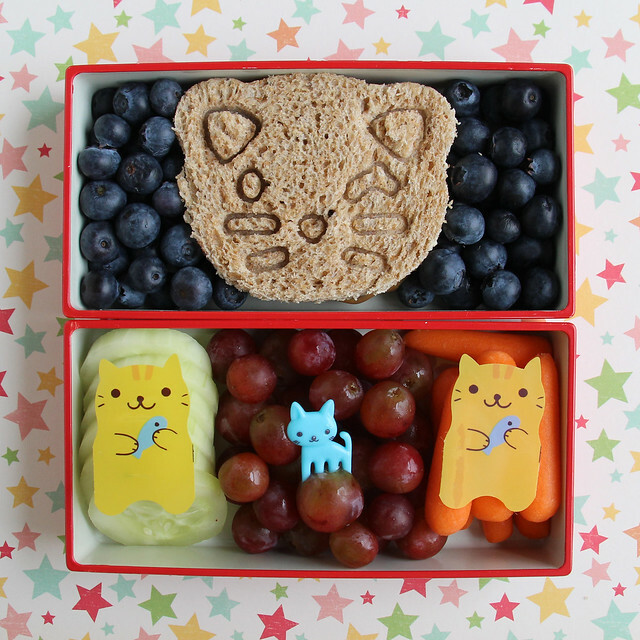 It featured a kitty cat pb&j sandwich made with our Cutezcute cutter/stamper set , blueberries, cucumber slices, grapes, and a few carrot sticks. I poked a kitty pick into one of the grapes and then while I was digging in my bento supplies I also pulled out a few pieces of kitty baran to use strictly as decoration.